U105 is now available on DAB across Northern Ireland. The station, available on FM in greater Belfast and surrounding area for the past 12 years, officially launched NI-wide on digital radio at 6am on Monday 10 July. Breakfast presenter and Programme Director Maurice Jay was in the hotseat for launch, playing some specially prepared audio as the finale to a 30-day on-air countdown on-air. The first song played across Northern Ireland was Fleetwood Mac’s Everywhere. Station Director, Peter McVerry, said it was an historic day for the Wireless Group-owned station. “We are delighted that our first-class presenter line-up is now available across Northern Ireland on DAB. 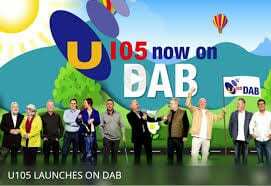 Access to digital sets and an improved transmitter network across Northern Ireland meant the time is now right for U105 to go onto DAB with a potential catchment of more than 1.5 million people across Northern Ireland. “U105 is the station with household names throughout the day. From Maurice Jay and Denise Watson on Breakfast, through Frank Mitchell on the Morning Phone-In Show, the one and only Carolyn Stewart on Lunch, Johnny Hero on Drive and Jerry Lang’s Jukebox from 7pm every weeknight. “Add to that our night-time and weekend line-up with talented broadcasters such as Linda Cullen, Rick Nugent, Stephen Woods, David Johnson, Ivan Martin and Paul McKenna and you can see why so many people tune into U105 each and every week. “Until now we have been receivable on FM in Belfast and the surrounding area as well as online, via our very popular downloadable apps and on Freeview. The move onto DAB is being supported by a major marketing campaign including a television advertising campaign worth almost £250,000 over the next six months. U105 will also be out and about on the ground with roadshows, Outside Broadcasts and U Crew Jeep activity right across Northern Ireland. Follow the hashtag #U105DAB to explore the very special and fun initiatives planned on social media and online to promote our exciting arrival on DAB.